Surgeon Vice Admiral AA Pawar, VSM has assumed charge as Director General Medical Services (Navy) on 01 Jun 2017. The Flag Officer is an alumnus of Armed Forces Medical College, Pune and was commissioned in the Indian Navy on 03 Mar 1980. The Flag Officer is a renowned Psychiatrist and was awarded the Gold Medal by Pune University for standing first in MD (Psychiatry) in the early part of his career. In an illustrious career spanning 37 years the officer has several achievements in both professional and administrative fields. In the professional field the Flag officer has served with distinction as a Psychiatrist in all major hospitals of the Indian Navy and AFMC. On promotion to the rank of Surg Captain, he was posted as Senior Advisor Psychiatry at INHS Asvini. He was the driving force behind setting up of Learning Disorder Centre, the first of its kind in the Armed Forces. He also conducted innovative seminars on Stress Management, Marital Harmony and Domestic Violence. The officer has Commanded INHS Asvini and Sanjivani with great distinction. At Sanjivani he introduced facility of ‘Sakhis’(lady attendants), and initiated a cashless scheme for treatment of naval personnel and their families at Amrita. His Command of Asvini witnessed replacement of non-functional high end equipment such as MRI, CT Scan, Cardiac Cath Lab, Ventilators, etc, under local delegated financial powers. He introduced the facility of online prescription and SMS based queuing system, resulting in reduced waiting time for patients. It was during his tenure that INHS Asvini was awarded Unit Citation and the Raksha Mantri Trophy for the 2nd Best Command hospital. 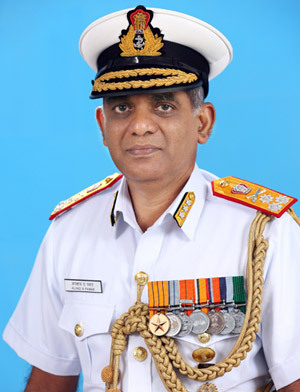 The Flag Officer has also held various other administrative appointments such as ACMO at Western Naval Command, PDMS (P&M) at IHQ MoD (Navy) and CMO at Eastern Naval Command, Visakhapatnam prior to taking up the appointment of Director General(Org &Peers) in the Office of DGAFMS on 12 Sep 16. For his dedication and commitment to the service, he has been awarded Vishisht Seva Medal in 2012, Chief of Naval Staff Commendation in 2012 and Flag Officer Commanding-in-Chief (WNC) Commendation in 2001.